Last year at this time I introduced you to Arnold Reimer, a retired pastor from a church I frequently attended — Bayview Glen Alliance Church in Toronto — and his blog titled Finishing Well. Today’s thoughts are from two consecutive posts there. A downside of being a news junkie is the gloomy reports of tragedy and violence one hears nightly. Accidents, shootings bombings, floods, hurricanes, sickness, death, deceit, fires, political strife and corruption – the list is almost endless! Worst of all are the stories of man’s inhumanity to man – the acts of violence due to anger, revenge, lust, greed, drunkenness, rebellion – the whole gamut of consequences brought about by bad choices. Too often a damaging environment in home, school, society, even religion or its absence, have shaped and twisted thinking and personality. Whoever rejects the concept of sin, or the depravity afflicting humanity, is either blind or detached from reality. The biblical explanation is, “the heart is more deceitful than all else and is desperately sick; who can understand it?” Truly, the “god of this world has blinded the minds of the unbelieving, that they might not see the light of the gospel of the glory of Christ, who is the image of God.” Our nation’s increasing rejection of God’s authority over what is, and is not, sin is determining the decline and bleakness of our future. The high cost of rejecting God and His commandments cannot be avoided. We reap what we sow. Who of us has not experienced, or observed, how easy it is to ambush one’s own life? A wrong choice or decision, carelessly made, can reek havoc to one’s future, marriage, finances, relationships, reputation, health, career or whatever. How grievous it is to see youth making choices about behaviour, morality, appearance, companions, habits, work ethics and attitudes that can only result in limitations and hurt, if not disaster. Oh, that young and old alike would seek the forgiveness of God that leads to salvation; and the wisdom of God that leads to wise choices, good decisions and true blessing. Another proverb admonishes: “Trust in the Lord with all your heart, and do not lean on your own understanding. In all your ways acknowledge Him, and He will make your paths straight.” From my youth, I have held on to that promise. I can report with conviction that deviation from it hurts, but obedience benefits. God is faithful to His Word and Ways. Thank God, most ambushes to which we victimize ourselves, though often hurtful, are not fatal. That allows us time, the wisdom of understanding, the grace of repentance, the kindness of forgiveness and the blessing of renewal. “Today, if you will hear His voice, harden not your heart, for the night comes when no one can work.” “If we confess our sins He is faithful and just to forgive us our sins and to cleanse us from all unrighteousness.” What a wonderful, healing promise – a way to avoid an ambush! The Proverbial statement, “They ambush their own lives,” is a sad description of the self-hurt most of us have experienced at one time or another. Wrong choices, bad behaviour and foolish rebellion result in wounds, dysfunction, crippling limitations, grief and the judgment of hurtful consequences – sometimes life-long and beyond. The list of things that ambush one’s life can be found in the Ten Commandments. Most of the disruption to family life, social chaos and corruption can be traced back to our disregard or violation of the divine will and order. Because our government, educational system and courts of law have often chosen to reject God’s counsel for a noble society, our country is increasingly losing its way and stumbling in darkness. The individual or family who rejects God’s way misses the pathway to a happy home and a safe environment. The evidence of this is most everywhere one cares to look. 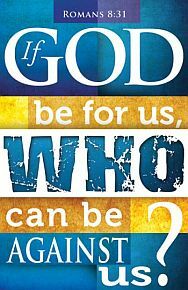 Our stubborn refusal to admit to our national rebellion against God and His ways, and thus to correct it, condemns us to devastating hurt! We are literally ambushing our own lives! Is there a solution? What can we, who care, do about this before it is too late? Proclaim faithfully the saving grace of our Lord Jesus. Respond to the convicting, convincing work of the Holy Spirit who bears witness to all who will believe that they are children of God. He guides into all truth those who listen. Demonstrate and teach the fear of God, the value of obedience to absolute truth, and the beauty of holiness. Sin must be named and forsaken. Guilt must be understood rather than be disregarded or shoved under a rug. The way of cleansing, purchased by the blood of Christ Jesus on the cross, must be applied. Search the Scriptures daily to advance your knowledge of God. Draw upon the sufficiency of Christ. Find and own the promises of God which cleanse and shape thoughts and behaviour. These actions build discernment and wisdom. Learn to recognize the deceitfulness of the devil, the lust of the flesh, the nature of idolatry and the lure of the world and its ways. Distrust yourself, but trust God. He satisfies the hungry soul. Put on the whole armor of God. 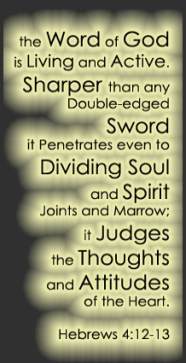 Practice using both the shield of faith and the sword of the Spirit. Expect to be attacked, and prepare for it. Rejoice that greater is He who is in you than he who is in the world. 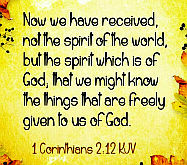 Worship God in spirit and in truth. Praise Him with a whole heart. Pray to Him without ceasing, rejoicing in the Lord always. As long as we walk this earth we will face things that ambush faith, hope, love, holiness, body, soul, spirit and our very lives. So be it! But our protection and victory are assured in Christ Jesus who has promised never to leave nor forsake us. Having done all, stand – and keep standing for victory in Christ Jesus is sure and His coming is near. 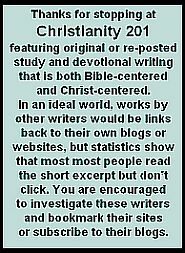 This article deals with a particular form we see in New Testament writings. This may interest some of you more than others, but I hope you’ll gain some understanding of the type of things academics and Bible historians wrestle with. This was posted at The Christian Century. Click the link below to read at source. What’s a vice list for? For more commentary on this week’s readings, see the Reflections on the Lectionary page, which includes Schultz’s current Living by the Word column as well as past magazine and online-only content. For full-text access to all articles, subscribe to the Century. it’s an example of a common ancient rhetorical device called a “vice list.” (This is not actually fun, but bear with me.) There’s another one later in the same passage, where Paul talks about “anger, wrath, malice, slander, and abusive language.” And there are several other examples in the New Testament, sometimes with corresponding virtue lists. The idea is straightforward: don’t do these things. Do these other things instead. Further fun fact: a couple hundred years after Paul, vice lists gave rise to the seven deadly sins. In the monastic guide the Praktikos, Evagrius Ponticus writes about what he calls “evil thoughts”: gluttony, impurity or lust, avarice, sadness, anger, acedia, vainglory, and pride. Through translation and adaptation, eight evil thoughts became seven deadly sins: pride, envy, anger, lust, gluttony, sloth and greed. The emphasis shifted as well–while Evagrius spends as much time on anger as anything, in the medieval world, pride became much more important. Likewise, Paul’s list of sexual transgressions has always been better remembered than the other failures he mentions. For nearly 2,000 years, it’s been used to shame sexual expression and keep women in their place. I know many who reject Christianity because of Paul, or dump the apostle and keep the rest of the New Testament. Evagrius seems to name barriers to progress in spiritual discipline, the thoughts and attitudes and attachments that would prevent desert monks from truly emptying themselves so that they could be filled entirely with the Holy Spirit. I wonder if something similar wasn’t also true for Paul. By the time he wrote to the Colossians, he was an experienced church planter and pastor. He knew how little heed congregants pay to moralizing from the pulpit. Neither Paul nor Evagrius appears to want his readers to think they will roast in hell for offenses named in these lists. Instead, the goal seems to be a fulfilled life. In Evagrius’s case this means a life united with God and freed from petty sorrows and regrets. For Paul, the goal is never the straight and narrow path. It’s to take part in the new creation, clothed in “compassion, kindness, humility, meekness, and patience,” as we were before the fall. Yes, that’s a virtue list, and it forces upon us a question. Not what are the rules?–that’s too simple. It’s the great question of ethics: who are you? Are you the kind of person who behaves like this, or the kind of person who behaves like that? Our society might be moving past telling people who they can and can’t sleep with. But this larger question–who are you?–remains to be wrestled with eternally. But sometimes, you find yourself fearing and trembling your fellow believer, especially when the “working out” means that you walk away from certain scripture verses with a different take on them than that of a brother or sister. I know fear of your fellow man wasn’t what the verse intended; but sometimes life seems to be play out like that. I’ve spent over an hour today moderating and reading and responding to blog comments stemming from older blog posts at the other blog; plus a more recent one. With a few of them, we’ve clearly agreed to disagree. But hopefully we haven’t been disagreeable. It’s hard not to be passionate about our pet doctrines. I can easily fall into that trap. But it becomes even more difficult when people have grown up without exposure to anyone who feels different about a particular element of theology than their own. And then there are the people who shut everything down with, “Well, that’s not in the Bible;” expecting that the scripture would provide crystal-clear guidance on things that weren’t invented or didn’t exist back then. Guess what? You’re right. It’s not in the Bible. But other things are, and we can interpolate where the dots connect by reading what the Bible does say about very similar things. Especially one thing: The mind and heart of God. We’re so quick to say that “Christianity isn’t a religion, it’s a relationship;” but many people fail to express their faith in relational terms. To which I would say maybe you are missing out on something. To know what God feels about things in our modern context, you need to first know God as a friend. I have friends who I haven’t seen physically in a long, long time; others who I haven’t so much as e-mailed; but I know how they would respond and react in certain situations because I know them. At this point however, it can still be a standoff, because the other person may feel they have as deep a knowledge of God and His will as you do. We know that while we may all stand in personal relationship to God; or if you prefer, to Jesus; the dynamic of that relationship may be quite different for different people. So work out your doctrine with fear and trembling. Work out your personal ethics with fear and trembling. Work out your systematic theology with fear and trembling. But remember, that all around you are other Christ followers — seeing as through frosted (or fogged up) glass — who are doing the exact same thing. With the cross of Christ in view, we will eventually find ourselves drawing closer to each other. But it may take time.